At Trinity Grove, a 100-bed skilled nursing facility in Wilmington, North Carolina, residents will be riding out Hurricane Florence — despite widespread evacuations triggered by the Category 3 storm, which could potentially deliver a historic blow to the Carolinas. Trinity Grove has food and water, and a 750-megawatt generator that can keep the entire building running, said Ted Goins, president and CEO of Lutheran Services Carolinas, which operates Trinity Grove as well as other skilled nursing facilities throughout the state. But the decision to keep the elderly residents where they are instead of evacuating them wasn’t an easy one. Given their residents’ age and feebleness, nursing home staff decided that hunkering down was best: The seven-year-old building that houses Trinity Grove was built “in anticipation of today,” Goins said, explaining that it’s on high ground and that the roof was built to withstand high winds. But residents there have never been through anything like this. They have never had to even consider evacuating. As health care facilities, nursing homes sometimes have the option to not abide by evacuation orders if they feel it is not in the best interest of their patients and have an alternate emergency shelter-in-place plan, according to Dr. David Dosa, a geriatrician at the Providence VA and a health services researcher at Brown University. And past studies have shown that in some cases, evacuating can cause more harm than good. Dosa was the lead author of a 2011 study that found that evacuating nursing home residents can have a significant, and sometimes deadly, impact on their health. The study, which looked at more than 36,000 nursing home residents exposed to Hurricane Katrina, found that 90 days after the storm, there were 579 more deaths and 544 more hospitalizations than in years when there was no hurricane. “Basically, you’re damned if you do and you’re damned if you don’t, as one [nursing home] administrator told me,” Dosa said. He said moving frail senior citizens comes with complications that younger, healthier people might not encounter during an evacuation. But staying comes with obvious risks, too. 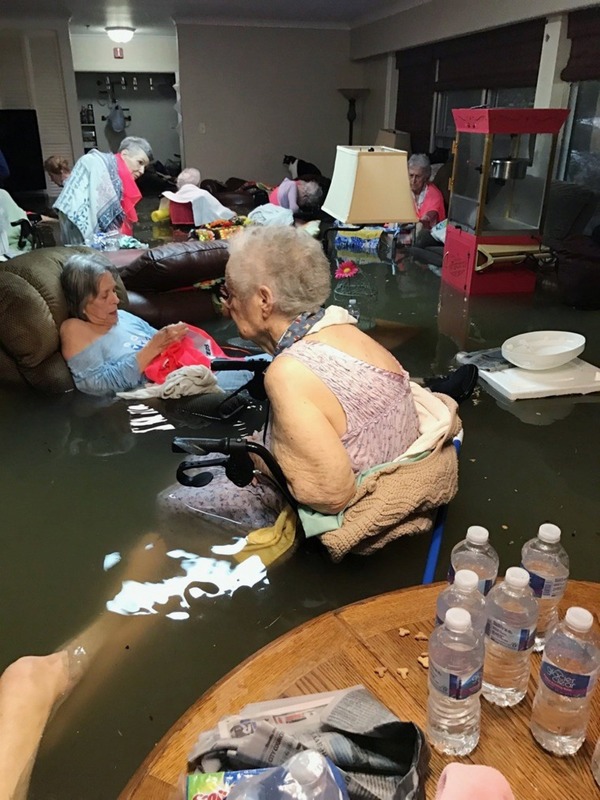 Last year, a photo of nursing home residents in Dickinson, Texas, who were up to their waist in floodwater, became an iconic image of Hurricane Harvey’s wrath. While those residents were rescued after their photo went viral, sheltering in place has ended disastrously for other nursing homes: During Katrina, 35 residents drowned in one nursing home, St. Rita’s in St. Bernard Parish. And when Hurricane Irma struck Florida last year, more than a dozen nursing home residents died after the Rehabilitation Center at Hollywood Hills lost air conditioning when its transformer was damaged during the storm. “Evacuating a center is a serious undertaking and not without risk given the care needs of the residents, many of whom are wheelchair or stretcher dependent for transportation. The decision to evacuate is, therefore, fact-and-circumstances based,” he said via email. Where residents go also becomes an issue in evacuations. Some are transported to other nursing homes or hospitals, although Dosa said hospitals typically don’t want to house anyone before a storm hits because they are preparing for an influx of patients after the hurricane. Others go to standard evacuation centers, like high school gyms. The ideal scenario, if a nursing home is going to be evacuated, is for a relative to pick up a resident, he said. He encouraged nursing homes to do exactly what Trinity Grove are doing, provided they can have shelter from water and wind and are fully stocked with food, water and medication. “By moving patients, you’re going to lose two or three people. The only difference, of course, is they may die 30 or 40 days hence, but they can still be attributed to having succumbed to the storm,” Dosa said. At Trinity Grove, the staff is hoping for the best. “All we can do is the best we can do, and I think everybody has taken this extremely seriously,” Goins said.